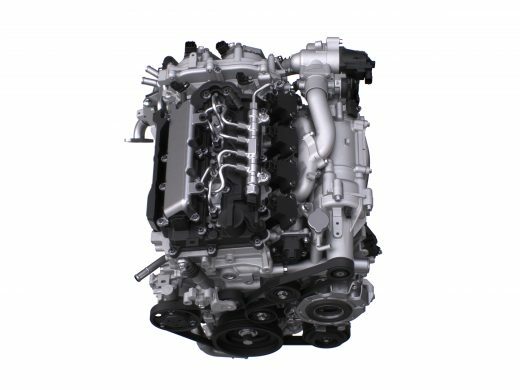 Featuring Spark-Controlled Compression Ignition, a never-before-seen combustion method, Mazda’s SKYACTIV-X engine represents the second step in Mazda’s quest to develop a petrol engine with the ideal internal combustion mechanism. 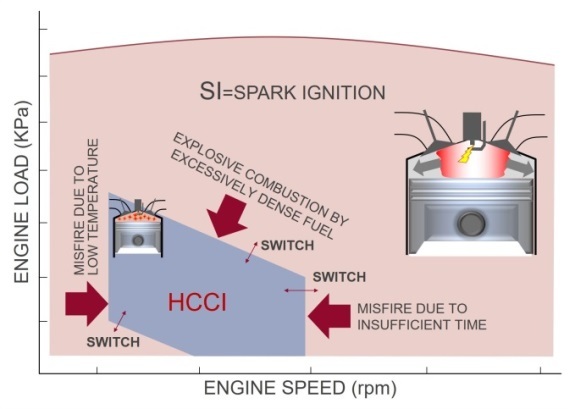 Developing compression ignition for petrol engines has long been a goal of engineers. In the SKYACTIV-X, spark plug ignition is used to control compression ignition, resulting in dramatic improvements across a range of important performance indicators. 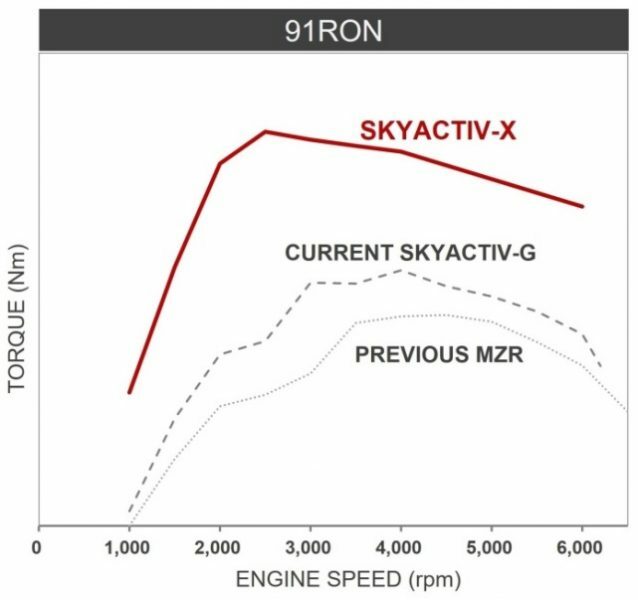 The SKYACTIV-X is a ground-breaking new engine exclusive to Mazda in which the benefits of a spark-ignition petrol engine—expansiveness at high rpms and cleaner exhaust emissions—have been combined with those of a compression-ignition diesel engine—superior initial response and fuel economy—to produce a crossover engine that delivers the best of both worlds. 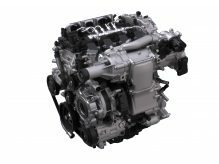 Coming after Mazda’s SKYACTIV-G petrol engine and SKYACTIV-D diesel engine, this third SKYACTIV engine has been given the new name of “X” in recognition of this dual role. 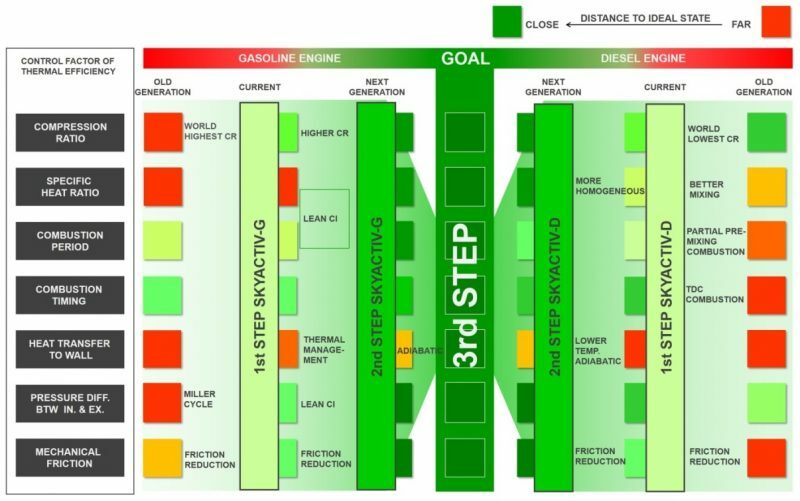 As we have moved along the road map shown above, we have undertaken a fundamental re-examination of the nature of combustion, with the aim of making some major improvements in the efficiency of the internal combustion process. 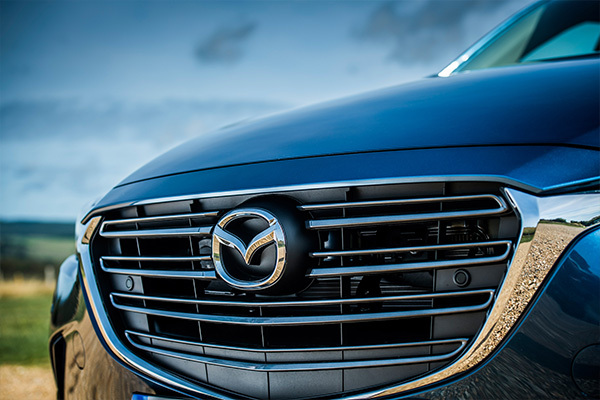 In the SKYACTIV-X, the latest SKYACTIV engine, we have worked to boost the air-fuel ratio. In order to do this, we had to enable lean burn, in which larger quantities of air are combusted. The ideal (stoichiometric) air-fuel ratio is 14,7:1. Creating a higher air-to-fuel ratio by more than doubling the amount of air raises the specific heat ratio and lowers the combustion gas temperature. This, in turn, reduces cooling losses. Meanwhile, a design that introduces larger amounts of air reduces the losses from throttle closure, resulting in improved fuel economy. However, the problem is that if this kind of lean mixture of air and petrol is burned using the flame propagation-based combustion which occurs when a spark plug is used, combustion tends to become unstable. To overcome this problem, compression combustion in high-temperature, high-pressure conditions must be employed. This means that such an engine will need to adopt the compression ignition used by diesel engines. 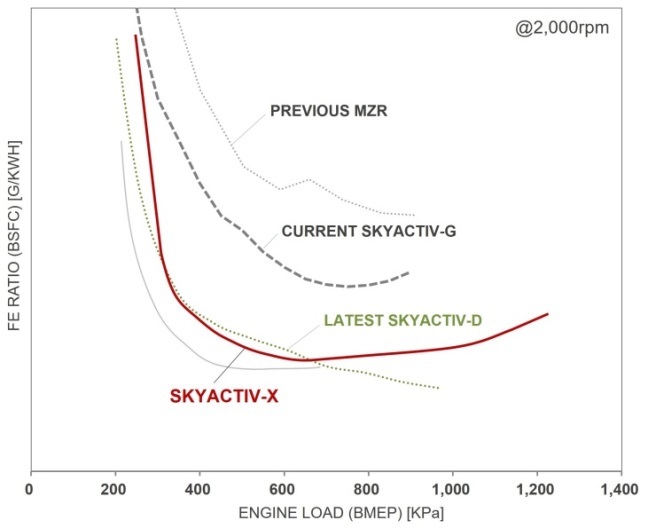 In developing the SKYACTIV-X, we have therefore improved the seven factors which need to be controlled for compression ignition of a lean air-fuel mixture. These include the compression ratio (which needs to be raised in order to realize the required high-temperature, high-pressure conditions), combustion timing near top dead centre (which is found in compression ignition), and a combustion period in which all the fuel burns simultaneously. 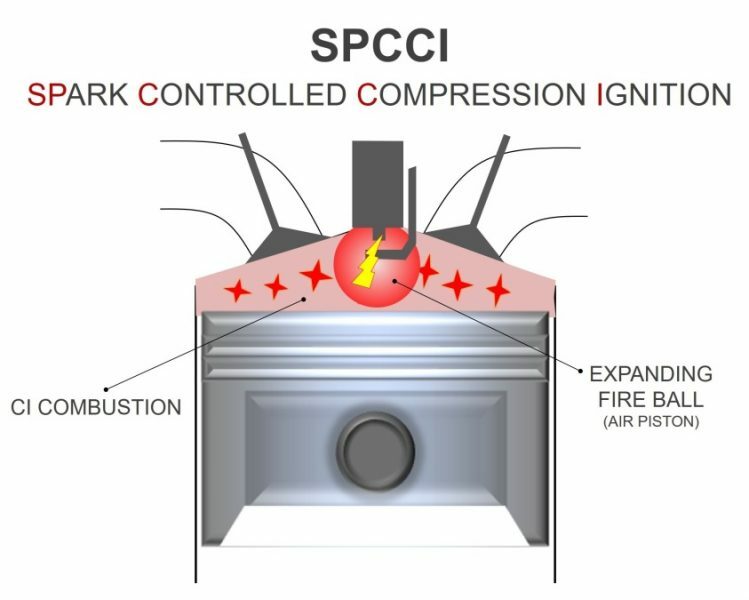 Although SPCCI is an entirely new combustion method, it is based on two existing functions—ignition and injection – which Mazda has further refined and meticulously recombined. To do this, Mazda has further developed several elementary technologies—a new piston head design and super-high-pressure fuel injection system to support compression ignition, and a high-response air supply which can deliver larger amounts of air—and combined these with an in-cylinder sensor which serves to control the entire engine. Compared with the complicated structures that were previously required in order to utilize the HCCI concept, the hardware for SPCCI is simple and lean, with no unnecessary complexity. In other words, the geometric compression ratio is raised to the point where the air-fuel mixture is on the verge of igniting (due to compression) at top dead centre. At this point, an expanding fireball created by spark ignition provides the final push that causes the whole mixture to combust. The timing and amount of pressure required are in a continual state of flux depending on constantly-changing driving conditions. The SPCCI system is able to control the spark plug ignition timing, meaning that pressure and temperature within the combustion chamber can be optimized at all times. Because a spark plug is used all the time, the system is able to switch seamlessly to spark ignition combustion in rpm or load ranges where compression ignition would be difficult. In this way, the system ensures that the compression ratio is never raised too high, while enabling a simple design which does not require complicated features such as variable valve timing or a variable compression ratio. To minimize compression time and make compression ignition as efficient as possible, the fuel must be vaporized and atomized very quickly and then immediately dispersed around the whole of the cylinder. The SKYACTIV-X therefore features a system capable of injecting fuel at super-high pressure from a multi-hole fuel injector positioned in the centre of the combustion chamber. This causes the fuel to be vaporized and atomized instantly, while powerful turbulence is simultaneously created, greatly improving ignition stability and combustion speed. 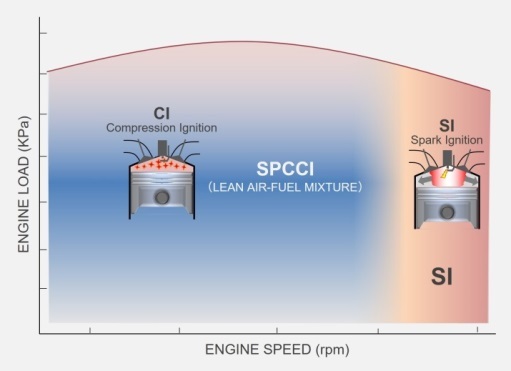 Super-high-pressure fuel injection enables SPCCI, which suppresses abnormal combustion even at full throttle/low rpms where traditional gasoline engines have to retard ignition and thus sacrifice efficiency and power. With an engine displacement of 2.0L, the SKYACTIV-X delivers at least 10 percent more torque than the current SKYACTIV-G, and up to 30 percent more at certain rpms (data as of August 2017, during the development process). 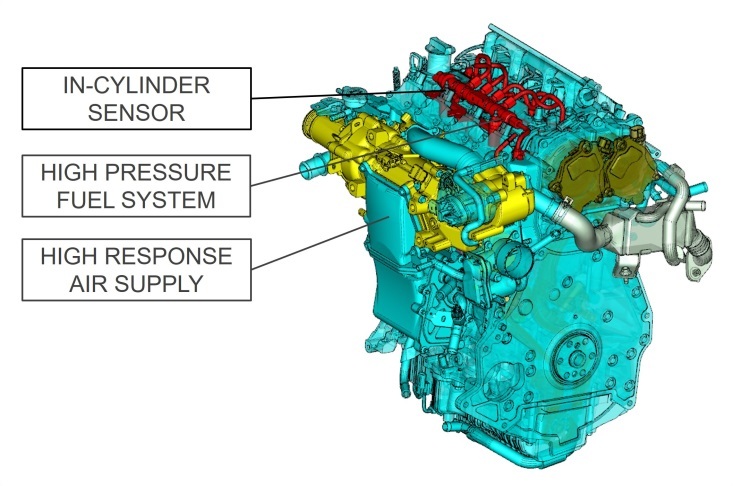 In addition, because the throttle valve is open most of the time, it exhibits the superior initial acceleration response found in diesel engines which do not have a throttle valve. On the other hand, the SKYACTIV-X spins up into the higher rpm ranges as smoothly and easily as a typical petrol engine. 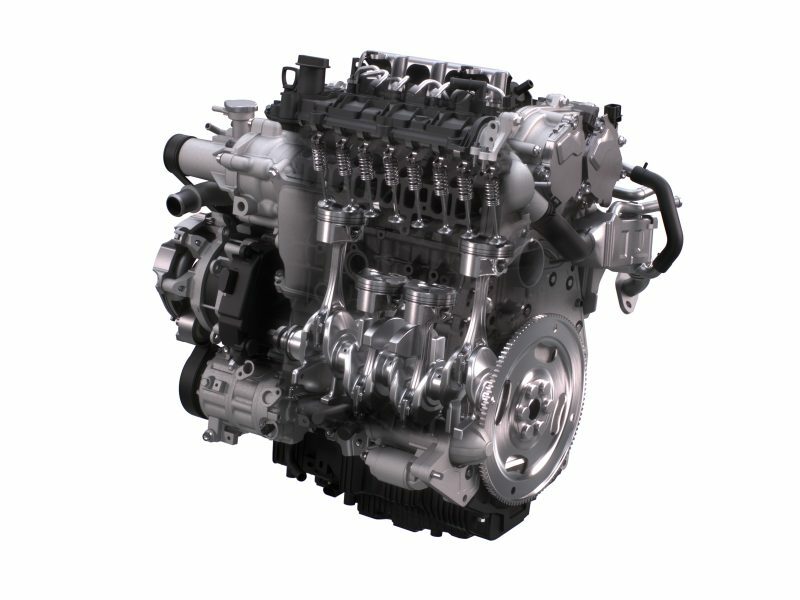 Unique to Mazda, the SKYACTIV-X is a new kind of combustion engine that combines the advantages of gasoline and diesel engines to achieve outstanding environmental performance and uncompromised power and acceleration performance. This revolutionary technology represents the start of an exciting new stage in our quest to develop the ideal internal combustion engine. 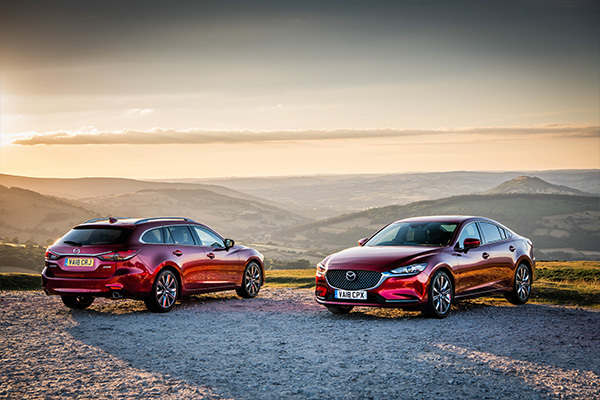 Fully supporting the Jinba Ittai driving experience Mazda aims to provide, SKYACTIV-X was developed in consideration of our planet and all who live here.